June seemed like a hard month, not just for me but for lots of people. It wasn’t a bad month for me, I did have a lot of fun. It was just a busy month. So this month I’m going to try to get back on track. Lets start with knitting. Way back in the year 1902, I started this pair of striped socks. At least that’s the way it seems. I long ago forgot when I started these socks. The good news is that I finished them at the end of June. I had to reformat a large hard drive one Saturday at work, so what better time to knit on my socks. I ended up finishing the last sock just about the time the hard drive finished formatting. Maybe I’d get more knitting done if I had to reformat more hard drives. The yarn is Steinbach Wolle Strapaz, Ringel Color. It was a little harsh to knit but it isn’t bad after they’re washed. You don’t get a lot of yarn in each ball. My feet aren’t that large and I ended up with only a few yards left. They’re nice and bright and I like them. I even managed to do a halfway decent job of matching the socks. I seem to have acquired a batch of future frogs as pets. Okay technically they’re not my pets but now I feel obligated to take care of them. It all started with this little plastic kiddy pool I’ve had in the back yard for the ferrets to play in. This spring has been very, very wet. It’s been so wet, you can hear frogs croaking all around the house every night. Every time I would empty the pool, it would storm and fill up again the next day. If I turned it over, it would storm and blow the pool around the yard and the pool would fill up again. So I kind of got tired of emptying it. It rained so much though that the water stayed clear so I didn’t worry about it too much. Then the other day when I went out to fill the bird feeders, I noticed it had turned green with lots and lots of little black dots. 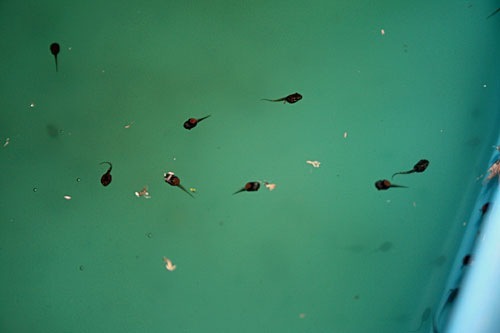 Yes, I’ve got about a hundred or more tadpoles in my little pool. This picture really doesn’t do it justice. Now that it has stopped raining, I feel obligated to make sure there’s plenty of water. Plus what the heck do tadpoles eat? If it’s algae, I’m okay. If even half of those tadpoles become frogs, it’s going to be hopping around here. The Tadpole Adoption Project. I like it! Oh, I love the socks – I’m envious!! And, I love that you are nurturing the tadpoles! Love the colors! Perfect for summer….although maybe wool isn’t. Poor Dexter, havign to eat kitty food, I’m sure its torturous. YAY for multitasking, the only way to get some knitting projects knit! Do you think that once the tadpoles get older, they can fend for themselves, or do you have to release them somewhere close to a pond? At least they’ll help you with any insects in your yard — maybe I should get a pool and encourage them for all the mosquitoes we seem to attract. Like the stripes! 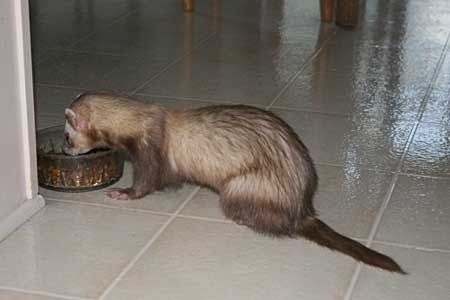 Yeah, I was SO worried that the ferrets were starving!!!!!!! The hopping ought to keep the ferrets entertained! Cat, too! Earl decided he’d have frog legs one night not too long ago. Andy intercepted him and returned the frog to the pond.